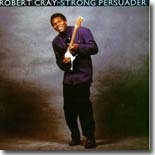 In 1986, when Robert Cray released Strong Persuader, it was the culmination of a decade of struggles ... not just for Young Bob, but also for the blues genre in general. For the most part, many people’s image of the blues in the early '80s was limited to B. B. King’s infrequent appearances on The Tonight Show and the Blues Brothers movie. Many musicians had gone years without a recording contract of any kind (unless they went overseas) and steady work was hard to get. Cray himself toiled away mostly on the West Coast for years, sometimes opening for Albert Collins (whose appearance at Cray’s high school drove the youngster to begin playing the blues) and playing with others like Curtis Salgado (an inspiration for John Belushi’s Jake Blues character). Cray formed his own band in the late '70s and eventually became a big draw at many Northwestern festivals and clubs. Cray was able to release three albums before Strong Persuader. His debut, Who’s Been Talkin’, was released on the Tomato label, but disappeared when the label folded. However, the next two releases, both on the Hightone label, were Bad Influence and False Accusations. Both of these albums received a lot of acclaim, even garnering favorable reviews in music magazines like Rolling Stone and Downbeat. The accolades, plus Cray’s appearance with Collins and Johnny Copeland on the Grammy-winning Showdown!, earned him a major record deal with Mercury, with the first release being Strong Persuader. The newfound recognition and attention apparently inspired Cray, as well as his usual production team of Bruce Bromberg and Dennis Walker, because Strong Persuader is an incredible ride from start to finish. While Cray’s roots are in the blues, with his stinging guitar strongly reminiscent of Collins and Albert King, his vocals owe a considerable debt to soul belters like O. V. Wright and Otis Redding. The songs featured on his albums over the years, whether written by him or Walker (as D. Amy), also owe a debt to composers like Bobby Womack, as they usually veer more toward urban situations more often found in R&B and soul tunes than traditional blues. Several of the tracks are on their way to becoming modern blues standards, most notably the opening cut, the menacing “Smoking Gun,” with its vivid imagery. In fact, it’s hard to find anything less than stellar on the disc, which features now-familiar Cray classics like “I Guess I Showed Her,” “Right Next Door (Because of Me),” “Nothin’ But A Woman,” and “I Wonder.” These songs drip with tension and sensuality. Cray’s band at the time included longtime bandmate Richard Cousins on bass, Peter Boe on keyboards, and David Olsen on drums. Strong Persuader was also the beginning of a long working relationship with the Memphis Horns (Wayne Jackson – trumpet & trombone; Andrew Love – tenor sax). The Horns only appeared on a couple of tracks this time around, but would continue to play a bigger role in Cray’s sound for many years. Strong Persuader was a phenomenal success for a blues release. The album went platinum, rare air for a blues recording, two of its songs, “Smoking Gun” and “Right Next Door (Because of Me),” enjoyed Top 40 success, and Cray won his second consecutive Grammy. He (along with Stevie Ray Vaughan, the Fabulous Thunderbirds, and others) also helped inject some life into the moribund blues scene for the first time in years. Since then, Cray has maintained his success for the most part, though none of his subsequent releases reached the heights of Strong Persuader. He’s made changes over the years, moving effortlessly from blues to soul and back again, and with his personnel, including Cousins (who departed from the band in the early '90s, but has recently rejoined). Though some critics have questioned Robert Cray’s “authenticity” as a blues artist, they simply ignore the fact that his vision of the blues played a major role in the music’s revitalization in the 1980s, and also helped pave the way for many new artists as well as shining the spotlight on many older ones who had been largely ignored for years. Strong Persuader was one of the first steps in the process, and is required listening for all blues fans.